People have used smoking to preserve red meat, poultry, and seafood for thousands of years. 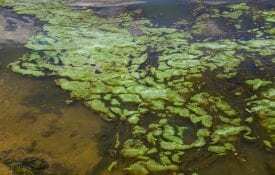 Worldwide, smoking still ranks alongside salting and drying as one of the most used forms of food preservation. In the United States and some other developed countries, however, smoking has become somewhat of a forgotten art. Besides simply being a means of preparing food, smoking can also be a form of recreation or diversion, provide the focal point for an afternoon or evening of family activity, and allow the cook(s) an opportunity to be creative. Among the equipment now available for smoking are electric and gas grills and smokers. Nowadays, a seemingly unlimited array of food may be cooked on the backyard grill. Many Alabama seafoods are prime candidates for smoking because of their nutritional composition, physical attributes, and flavor. Most seafoods are low in fat, which aside from being less prone to flare-ups, provide a healthful and delicious means of reducing fat in your diet. Seafood also has smaller percentages of skeletal and connective tissues than equal portions of red meats or poultry, making seafood fast and easy to smoke. And, seafood offers a variety of flavors that can be brought out during the smoking process. The smoking process described here is not intended to be used for the purpose of preservation. Rather, this article describes a “backyard” slow-cooking process in which smoke is generated and used to flavor seafood. 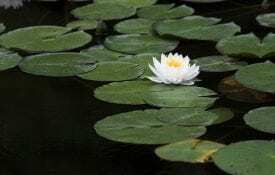 The smoked seafoods that result from following these directions are cooked foods that must be refrigerated or frozen like any other cooked red meat, poultry, or seafood. Whether you catch them yourself or purchase them from a seafood retailer, many Alabama fish, crustaceans, and molluscs are ideal for smoking. The following is a basic list of Alabama seafood suitable for smoking. Check with your local seafood retailer to find out what is fresh, seasonal, and suited to your budget. When purchasing whole or drawn (eviscerated) fish, allow 3/4 to 1 pound per serving. For pan-dressed fish, allow 1/2 to 3/4 pound per serving. And, purchase about 1/4 to 1/3 pound of fish steaks or fillets per person. 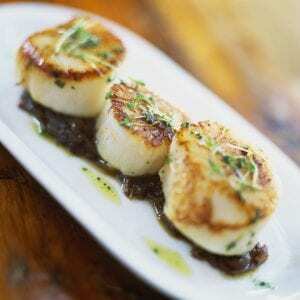 Usually, 6 to 8 medium to large clams, oysters, or scallops is a normal serving, although some people will eat more. You may need as many as 1 dozen mussels for one serving because of their smaller size. lobster tails make one serving; and 1 pound of tail meat from prawns, rock shrimp, or shrimp will feed three to four people. In general, fresh seafood should not smell “fishy.” Choose seafood that has a faint sea odor. Freshly cut fish, peeled crustacean meats, and shucked mollusc meats should be moist, never slimy or dried around the edges. Fresh, high-quality fish have clear, well-rounded eyes. Older fish may have eyes that are clouded, dry, and sunken-in. The gills of a fresh fish are bright red, not darkened or slimy. The flesh should be moist and springy to the touch, not mushy. Crustaceans also have several easily noticed quality recognition points. The tail meat from prawns, shrimp, lobster, and rock shrimp should be uniformly light colored with no signs of discoloration around the tail joints. Reject crustacean tail meat that is slimy or has an objectionable odor. Likewise, fresh soft-shell crabs should have a mild, pleasant odor. The crab’s color should be bright. If you purchase molluscs in the shell, make sure they are alive. Live hard-shelled molluscs hold their shells closed tightly when handled. Containers of shucked mollusc meats must bear either a “last sale date” or “date shucked.” Fresh mollusc meats can only be sold up to 14 days after “date shucked.” Choose oysters that have a natural creamy color and clear liquid. Fish, crustaceans, and molluscs are among the most perishable muscle protein commodities. Ideally, seafood should be purchased the day it is going to be used. 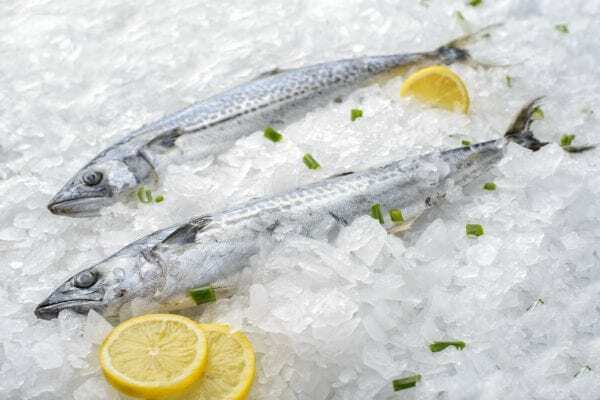 When that is not possible, care must be taken to adequately and appropriately refrigerate or freeze fish and seafood until it is prepared and cooked. Live, hard-shell molluscs stored un-iced in the refrigerator at 35 to 40 °F should remain alive for 7 to 10 days. 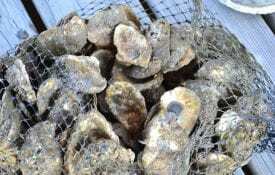 Freshly shucked mollusc meats can be stored for a week to 10 days if packed in ice in the refrigerator. With the exception of shucked scallop meats, frozen molluscs are not good candidates for smoking because the meat is soft and prone to shrinkage. Fresh soft-shell crabs will maintain their quality better when wrapped in plastic and packed in ice in the refrigerator; for maximum quality, use them within 2 days of purchase. Soft-shell crabs can be stored and good quality maintained for up to 6 months if they are wrapped in several layers of plastic and stored in a freezer at 0°F or lower. Thaw soft-shell crabs only overnight in the refrigerator. If you plan to eat them fresh, fish, shrimp, scallop meats, and freshwater prawns and lobster tails can be placed in zip-top storage bags or plastic storage containers and kept on ice in the refrigerator (32 to 34°F). Fresh-shucked scallop meats and crustacean tail meat can be stored in this manner for 3 or 4 days. Fresh fish stored this way will keep for 5 to 7 days. Alternately, scallop meats, crustacean tail meat, and fish can be frozen in water and stored in a freezer at 0°F or lower for 4 to 6 months. Thaw these seafoods carefully, either overnight in the refrigerator or under cold, running tap water immediately before use. Prepare your seafood in the desired form. (Seafood markets will usually do this if requested.) Whole dressed or pan-dressed fish, fish steaks, and fillets are appropriate forms for smoking. Molluscan shellfish in the shell and whole soft-shell crabs are ideal for smoking just as they are. And, crustacean tails can be smoked either completely peeled or butterflied in the shell (split halfway through) and placed on the grill with the shell side down. Add 1 cup salt to 1 gallon cold water; stir until dissolved. be marinated for 30 minutes. Fish fillets or steaks from 3/4-inch to l-inch thick require 45 minutes brining time. And, whole fish or portions more than l-inch thick should be marinated for 1 hour. Marinating fish in salt brine serves two functions: it adds flavor and firms the flesh for smoking. Crustaceans and molluscan shellfish in the shell need not be brined. in a bucket of water for at least 30 minutes. If you intend to use charcoal briquets as the heat source, line the bottom of the grill or smoker with foil for easy cleanup. Place the briquets in a mound at one end of the grill. flavor of smoked seafood. Use an electric fire starter or kindling instead. A warm to moderate fire (an air temperature of 150 to 250°F inside the covered grill or smoker) is most commonly used to smoke seafood. However, some people prefer to reduce smoking time by smoking seafood at temperatures up to 300°F. Start briquets about 30 minutes before you begin cooking. Let the briquets burn until white-hot. Leave them in a mound. 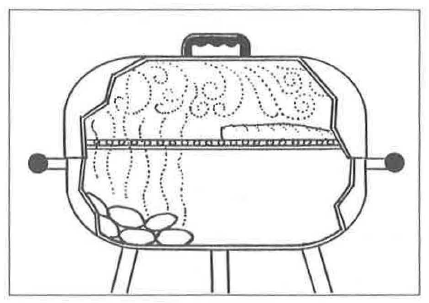 Outdoor gas or electric grills and smokers should be set at 250 °F and preheated for 15 minutes. The temperature can be adjusted up or down later during the smoking process. chips directly above the heat source. For gas or electric smokers, follow the manufacturer’s directions. Oil the grill with vegetable oil or non-stick spray to prevent sticking. Adjust the grill height to 4 to 6 inches above the heat source. 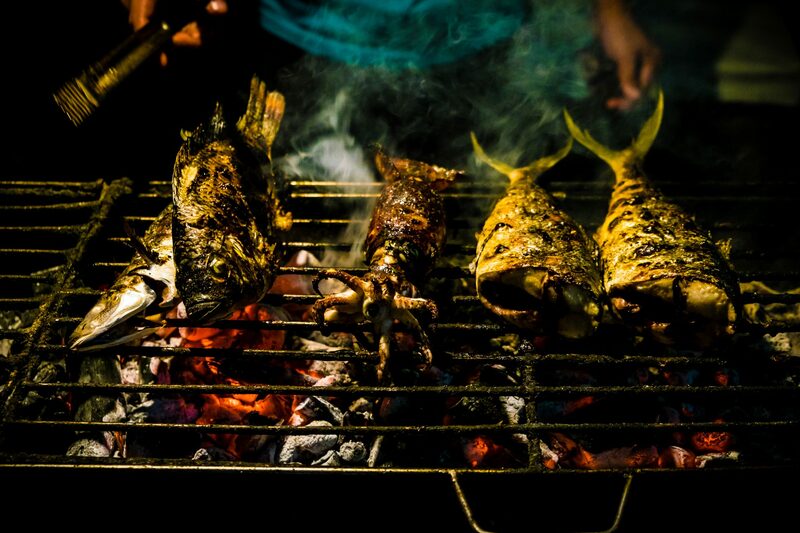 When using charcoal as the heat source, place seafood at the end of the grill opposite the briquets. If you are using an electric or gas outdoor grill, heat the burner on one side, and place the seafood on the opposite side. The heat source in most gas or electric smokers is usually located in the bottom, far enough from the seafood that scorching or burning should not be a problem. 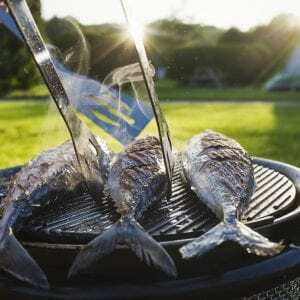 For fragile fish, use an oiled, hinged fish basket, a small-mesh seafood grilling screen, or perforated aluminum foil. Close the grill cover and begin timing (see Smoking Time Is Critical). Add more drained, damp wood chips whenever smoke diminishes or ceases altogether. If you are using charcoal briquets as the heat source, you might also need to add a few more briquets from time to time during the smoking process. Baste seafood frequently to maintain moistness and prevent sticking. With the exception of large, whole fish, most seafoods do not need to be turned during smoking. Smoking is nothing more than a method of slow cooking in which the food is flavored with smoke. The most important point to remember when smoking seafood is not to overcook it. Perfectly smoked seafood is moist and flavorful. Overdone, it becomes dry and tasteless. • A meat thermometer should be used to determine doneness in large whole or stuffed fish and seafood. Cook large whole or stuffed fish and seafood until the thickest part, including stuffing, reaches an internal temperature of at least 140 degrees F.
Fresh or dried herbs like thyme, rosemary, dill, basil, and oregano enhance the flavor of seafood. Soak herbs in water for several minutes, drain, and pat dry. Toss damp herbs directly onto briquets (or lava rocks) just before cooking. Marinades can be as easy as a bottled salad dressing or a homemade combination of oil with vinegar or fresh lemon or lime juice and your choice of seasonings. Save extra marinade to brush on seafood as it cooks. Sauces should enhance, not mask the taste of seafood. Match the flavor level of the sauce to the seafood being smoked. Baste with a mixture of equal parts of lemon juice and butter or margarine. Alternately, mayonnaise can be spread on fish fillets to keep them moist. Be sure fish and crustaceans are completely cleaned (scaled, peeled, eviscerated) before grilling. Pat seafood dry with paper towels before applying oil. combined with cream cheese, chives, and chopped nuts to form a smoky fish log. periods will provide the time necessary for some of the fats to become rancid.